Many of the finest attractions in Portsmouth are clustered within walking distance of one another in Olde Towne. This neighborhood features a scenic waterfront, upscale dining, a plethora of antique and boutique shops, and the largest collection of historic homes between Alexandria, VA, and Charleston, SC. Pick up the Olde Towne Walking Tour Map from the Visitor Center at 6 Crawford Parkway. The Naval Shipyard Museum presents the history of America's oldest and largest naval shipyard, which is located on the Portsmouth waterfront. Founded in 1767, it's been burned 3 times by retreating armies because of its strategic importance. Historic ships have been built here, including the first ironclad to engage in battle, the nation's first battleship, and the world's first aircraft carrier. Located at 2 High Street on the waterfront. The Courthouse Galleries, housed in the 1846 Courthouse, have rotating visual art exhibits, lectures, classes and performances. Corner of High and Court Streets, historic Olde Towne. The Lightship Portsmouth was built in 1915. She served for 48 years off the coasts of Virginia, Delaware and Massachusetts helping mariners avoid dangerous shoals or enter safely into harbors at night. Now the Lightship Museum, the ship's quarters are fitted out realistically and filled with artifacts, uniforms, photographs, models, and more. Corner of Water and London Streets on the waterfront. The Children's Museum of Virginia has over 90 hands-on exhibits for kids of all ages, including an awesome toy train collection and a planetarium. Your ticket to some truly amazing places and enlightening discoveries. 221 High Street. The Virginia Sports Hall of Fame is a 35,000 square foot interactive facility honoring inductees from all parts of the state. Fun for the family. 206 High Street. 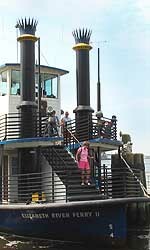 The Carrie B paddle wheel riverboat takes you on a tour of the Hampton Roads Harbor, including a ride by the Navy ships. Leaves from the dock at North Landing. 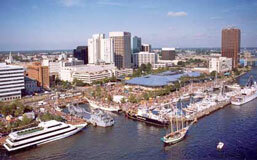 The Elizabeth River Pedestrian Ferry travels between North Landing and High Street in Portsmouth and the Waterside Marketplace in downtown Norfolk. It's fast, economical and offers a panoramic harbor view. 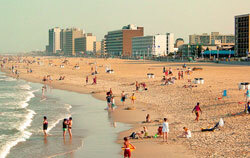 The Ferry operates every 30 minutes, with 15-minute service at peak times on weekends. The Portsmouth City Park offers a boat ramp, sailboat launch area, small watercraft pier, "The Links" (9-hole golf learning center with lighted driving range and natural putting course), playgrounds, lighted tennis courts, Friendship Gardens, shelters with picnic tables and grills and an excellent waterfront view. 140 City Park Avenue. The Hoffler Creek Wildlife Preserve is a 142 acre sanctuary for wildlife in the Churchland section of Portsmouth.